While Apple surprised with the announcement of a new fourth-generation iPad this week, the company may quickly update the product once again with a thinner and lighter model early next year, one insider believes. Analyst Ming-Chi Kuo of KGI Securities thinks Apple may feel pressure from Microsoft's new Surface tablet, especially considering that the fourth-generation iPad is the same weight and thickness as the third-generation model. "Though the iPad mini is expected to be successful, we think launching the lighter, thinner 9.7" iPad as quickly as possible matters more for Apple strategically," Kuo explained. If Microsoft Surface does catch on with consumers and businesses, it would pose a risk to Apple's current dominance of the "post-PC" world. For that reason, he thinks Apple will move quickly to redesign the iPad once again in the near future. Apple is expected to employ "GF DITO" touchscreen technology, otherwise known as GF2, in its redesigned iPad, according to Kuo. In combination with more power-efficient chips, Apple is expected to "dramatically lower the weight and thickness of the 9.7" iPad," Kuo wrote. 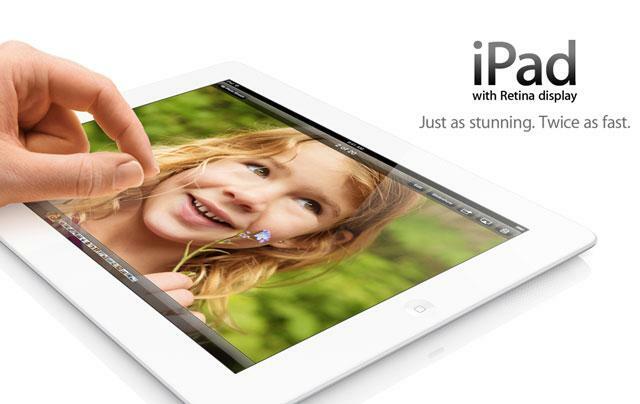 Apple is said to already be employing GF2 display technology in the new iPad mini. That helped to make the device 23 percent thinner and 53 percent lighter than the full-size iPad. The fourth-generation iPad unveiled by Apple on Tuesday marked an uncharacteristically short product life cycle for the company. It completely replaced the third-generation model, while the $399 iPad 2 remains without a high-resolution Retina display. The new fourth-generation iPad carries the same price points as its predecessor, while packing in faster performance with a new A6X processor that Apple said doubles the speed of the system's CPU and GPU. It also features Apple's new Lightning connector, replacing the legacy 30-pin design found on the third-generation model. Customers who recently purchased a third-generation iPad may be able to return their purchase and exchange it for the updated fourth-generation model at certain Apple retail stores.